Gotham Polish shares with us her top 5 winter polish nail polish trends. The Nailasaurus shows us her Mondrian inspired nails. Globe & Nails shares with us her "Trim the Tree" nails. Neverland Nail Blog shows us her cotton candy inspired nails. Polish, Please! shares with us her glitter gradient nails. Polish All the Nails! shows us her Christmas party nails. 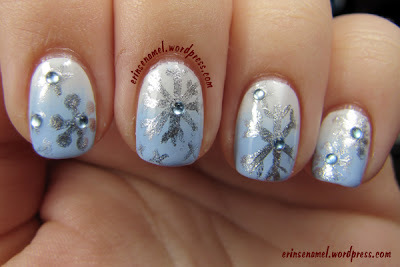 The Crumpet shares with us her snowflake nails. Life in Color! shows us her gingerbread man and candy cane nails. You can submit your links for Sunday posts here. Manicure Description: I started with a base of OPI My Boyfriend Scales Walls (2 coats), then sponged on Deborah Lippmann Let's Hear It For the Boy. I free-handed the snowflakes using Zoya Trixie and added rhinestone accents. 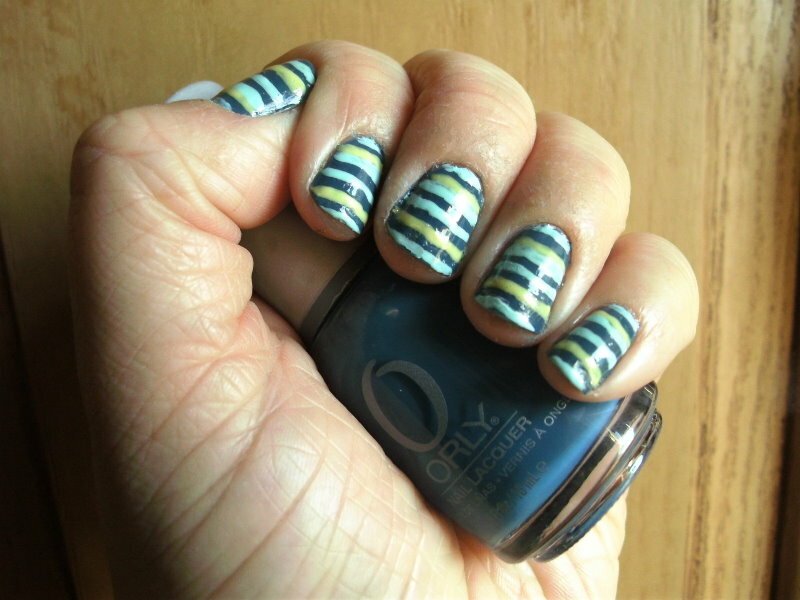 Manicure Description: I used 2 coats of Orly Sapphire Silk as a base color, then used a liner brush to paint on yellow (Sinful Colors Unicorn) and light blue (Kleancolor Pastel Teal) stripes. I need manis for next week and the rest of December! You can find information on how to submit your manicures for Sunday posts here. I love these manicures, I just added Sapphire Silk to my wishlist...forgot how much I wanted that! I got a mention! **starstruck** Thanks, girl! 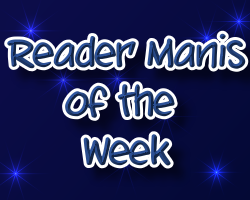 I really love these reader manis! Snowflakes are just so fun and I love those stripes! Happy Sunday! Thanks for the shout out, Steph!! !